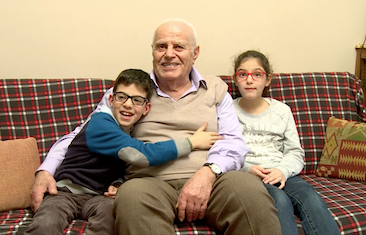 Searching for something educational and engaging for his grandchildren to watch on television, Boutros came across SAT-7 ACADEMY’s program My School. Now, watching My School together has become a regular family activity that benefits and bonds two generations. Boutros is a retired carpenter from Lebanon. He looks forward to spending time with his grandchildren – eight-year-old twins Aya and Iwan – who come to visit him twice a week. These days, the first thing they do when they arrive is eagerly ask to watch My School. The twins are just two of at least 1.3 million children already watching the SAT-7 ACADEMY program. Their grandfather enjoys watching with them and guides them in following the lessons, helping them with questions if they get stuck. Some of the information and questions are new for him too, so the generations are learning together. Both children already have ambitions for the future. Iwan wants to be a maths teacher, and Aya wants to run her own bakery. For now, they both enjoy the special time they spend with their grandfather, asking questions and learning from him and My School. Alongside the SAT-7 ACADEMY channel, SAT-7 has launched an e-learning platform on a new interactive website, www.sat7academy.com. Here viewers can watch programs on demand, customise their learning, and track their progress.